The U.S. housing bubble and the corresponding real estate market crash of 2007-2008 brought about one of the most severe economic downturns in America since the Great Depression. The fallout was extensive: banks failed, established companies declared bankruptcy, the net worth of American households plunged, and millions of Americans lost their homes and jobs in a great recession that quickly spread globally, submerging the economies of Europe, Asia, and the developing world. Among the many firms and individuals who acted irresponsibly, and maybe criminally, perhaps none did so with such flair and recklessness as Countrywide Financial. Before its rescue-sale to Bank of America (BOA), Countrywide was the largest mortgage lender in the United States. Countrywide became a “leader” of sorts in the lending industry, according to numerous lawsuits filed by the Department of Justice, by adopting reckless lending practices, encouraging fudged loan applications, and violating appraiser independence in order to gain market share. A move that, some say, led to other lenders lowering their standards to compete. A little-known fact is that the original whistleblower at Countrywide Financial, the man whose suit sparked an investigation that culminated in a one billion dollar settlement between BOA and the Department of Justice, is a real estate appraiser named Kyle Lagow. Kyle Lagow of Plano, Texas says he was an appraiser running his own firm for 14 years when he was contacted in 2004 by Landsafe and offered a position as an appraisal manager, responsible for building an appraisal division to span several states. “The third time they called they made the opportunity attractive enough and told me that I would be able to build a staff of quality appraisers. So I told them that as long as we do it right, I’ll run it,” Lagow says. At Landsafe, Lagow was tasked with hiring and training a division of staff appraisers spanning multiple states whose primary purpose was to appraise a growing volume of Countrywide loans. Ultimately, Lagow helped open new markets for the company, expanding Landsafe’s appraiser panel into Utah, Colorado, Arizona, Louisiana, Texas and Oklahoma. “An appraiser would turn in his or her appraisal. If it was low or didn’t meet value, it went to a reviewer. If the appraiser didn’t meet value, the reviewers were instructed to go and look at the market to see if they used the best comps and to try to discredit the appraiser. The kicker is that I have an appraiser who I trusted, hired and put on my fee panel because I believed they would do a good job. But at Landsafe, the entire review process was designed to ensure the appraisal came in at value. If one of my appraisers didn’t meet value, they were blacklisted. Our own company would turn them in to the state and call them a bad appraiser,” says Lagow. Unfortunately, extreme internal pressure to meet value and the blacklisting of quality appraisers was just the tip of the iceberg. In 2005, Lagow learned of a joint venture between KB Home and Countrywide, wherein Countrywide would provide the loans for new construction developments of KB Home. Lagow was tasked with hiring appraisers to complete that appraisal work. However, Lagow says that when his staff appraisers showed up at KB’s developments to appraise properties, they were turned away and told that KB had an agreement with Countrywide where it alone would decide who did the appraisals. Lagow soon learned that a separate appraisal manager at Landsafe was handling all of KB appraisal assignments; the work went to a small number of hand-picked appraisers. The DOJ suit alleges that in Houston, the appraiser chosen by KB Home completed over 400 appraisals in a single month by himself, all at a price of $450 per appraisal. Lagow says that he personally inspected many of the appraisal reports completed by the Houston appraiser. 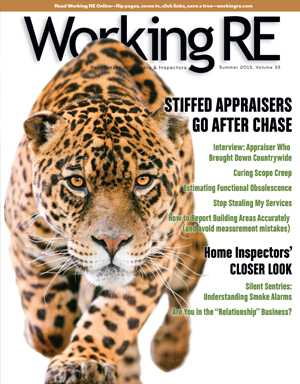 “I looked at appraisal orders. I could tell you when the inspection appointments were scheduled. One day, one was set for noon and the next one at 12:01 P.M. It was a total fraud,” says Lagow. Lagow’s words of warning fell on deaf ears as Landsafe executives proceeded to institute a “production-based” pay system where staff appraisers were forced to radically increase their appraisal volume in order to earn the same income, according to the complaint filed by the DOJ. Lagow also says that Landsafe also facilitated a channel whereby Countrywide’s own loan officers could request target “audits” of Landsafe appraisers who were not meeting value. The original suit filed against Countrywide by the DOJ lists over half a dozen appraisers who were “audited” at the direction of loan officers who were upset that appraisers were not meeting value. According to the suit, one of the appraisers that Lagow hired to add integrity to the appraisal process was told point blank by a KB Home sales manager that KB would no longer require his services if his appraisals came in below contract price. When he refused to go along with the fraud, the appraiser was blacklisted from completing appraisals on any Countrywide loans. “At the risk of losing my job I am forwarding this email to you and want to relay my deepest concern for the situation addressed. I report directly to you but I am also forwarding this to (a superior) because she and I have talked about general concerns in the past. I have spent considerable time looking over the KB Home situation in Houston, Texas and took some time to drive a couple of subdivisions this weekend and look around. As you are aware, one appraiser controls the orders and the values…I believe that (name redacted) and KB Home are engaged in a fraud to manipulate the local market. In looking at the appraiser’s reports, when he needs to, for value, he goes outside the market to access superior sales to bump up the market and then uses the same sales in future sales, thus establishing and manipulating the market. The appraisal reports I have examined have a continual characteristic of selective manipulations of the market data in an effort to pump up the market. It is my opinion that, based on very limited data, we could be making 115% loans in the markets and if you examine some KB Home subdivisions you see significant foreclosure rates. I believe that by allowing the situation to continue we are condoning the activity and placing at risk the jobs of our employees at Landsafe and Countrywide. I am even more concerned, and I do not have any supporting data other than the logic that an order has to come from us, that the individuals who mandated that only one appraiser be utilized may be a Countrywide employee and could be implicated in a conspiracy to defraud both the homeowners and the stockholders. Nothing changed as a result of the letter, Lagow says. Finally, in 2008, Lagow says he sent an email directly to Angelo Mozilo, CEO of Countrywide, urging him to stop the fraudulent practices and warning him that his executives were not reporting the facts to him. “I really wanted Mozilo to have not been aware of this. I wanted to believe that a guy who spent 40 years building this company wouldn’t want its legacy to be that we ran an industry off a cliff and that we gave our industry a bad name. I couldn’t believe that he could have known about it, I went to everyone else before I went to Mozilo,” says Lagow. Lagow explains that Mozilo sent someone down to, in his words, “put on a show.” He was even contacted by several of Countrywide’s top executives who seemed concerned, but the “conclusion” of management was that Lagow’s concerns were unfounded. By late 2008, Lagow learned that he needed treatment to combat cancer and he was subsequently fired from Landsafe. “I fought inside the company for a long time to stop what was going on. When I left I told them, look, I’m going to fight to fix this either inside the company or outside the company,” says Lagow. Leaving Landsafe wasn’t easy for Lagow. “At the time, I was pretty defeated. I built their market for them. They took my model and applied it to the east and the west coast. They didn’t have a clue how to hire and manage a staff appraiser division,” says Lagow. The rest is history. In late 2009, Lagow filed a whistle-blower complaint under seal, charging that Countrywide had committed fraud and violated the U.S. False Claims Act. But things got worse for Lagow before they got better. “Once the lawsuit was filed I couldn’t talk to anybody, not even my family. You go out there to try to help an industry, and no one even knows you’re fighting the fight. Your kids look at you like a failure, you can’t get any work. You’re fighting cancer. I lost everything, I had repo people knocking on my door,” Lagow says. Lagow’s complaint was among at least five other whistle-blower complaints that were rolled into the $25 Billion settlement between regulators and the nation’s largest banks in 2012. Lagow’s complaint was also critical to a $1 billion settlement between the Federal Housing Administration (FHA) and Bank of America in 2012. For his share of the settlement, Lagow will receive $14.5 million for his role as whistleblower. Lagow is thankful but says that it isn’t as much as people might think. “By the time the government takes its share, and the attorneys take theirs, it’s not as much of a windfall as everybody thinks. If I were working for the rest of my life, I would earn more than that,” says Lagow. He tool almost 5 years,but, he stood up. It seems to me this guy was completely ineffective at his job for a number of years, got fired and then grew a conscience.